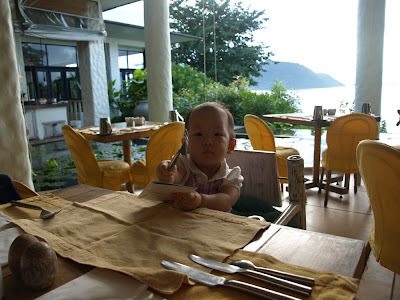 Natalie, Lauren and Ashley's Blog: Phuket! 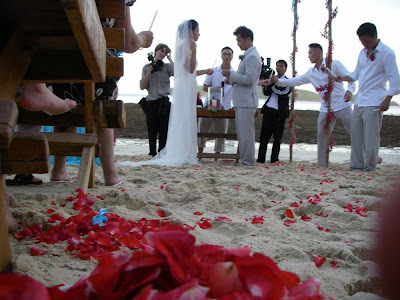 This weekend, we went to beautiful Phuket, Thailand to celebrate Jackie and Que's wedding. 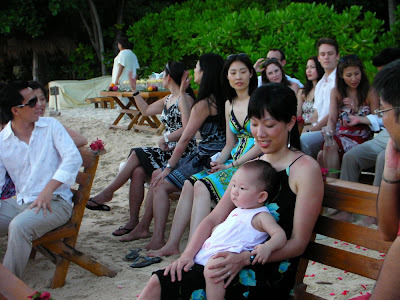 It was a beautiful wedding and the whole Wang family enjoyed lots of fun in the sun. 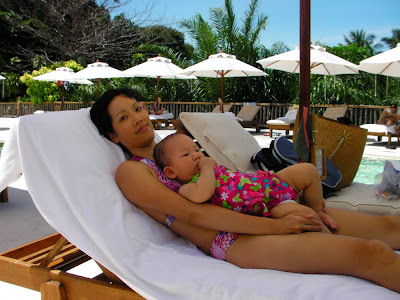 It was Natalie's first time to a "tropical resort" destination. We really wanted to see how she would fare on the beach and, although she loves the sun and water, she's not very fond of sand. In fact, every time we tried to put her down on the sand she keeps her little legs tucked in and will cry if any sand touches her at all. Natalie also kept very busy pointing out "woah woah" (dogs) and "baah" (birds) and "baah" (inflated water toys). All in all, a great trip! Below are photos from the trip. Videos to come soon. We've arrived! It's 11:00pm and all the fuss with customs and immigration has woken the sleeping beauty (she was a star on the plane and slept almost the whole way there). Our hotel room. Natalie fell asleep in the hour-long taxi ride to Evason Hotel. We put her down like this before unpacking and settling in. The next morning, right on schedule, Natalie woke us up at 6:00am. We stumbled out of bed and went for breakfast. 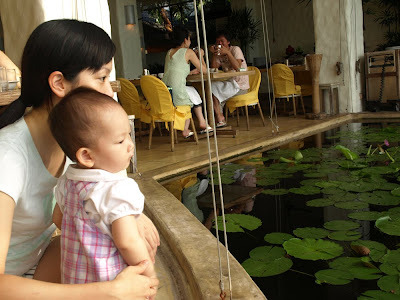 Next to the eating area was a pond with lots of lilypads and real frogs hopping around on them and tiny tadpoles just below the surface. Natalie in her highchair. 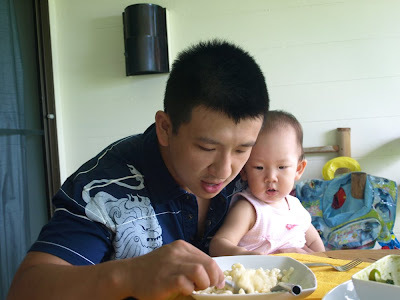 All of us ate very little while in Phuket... it was too hot! 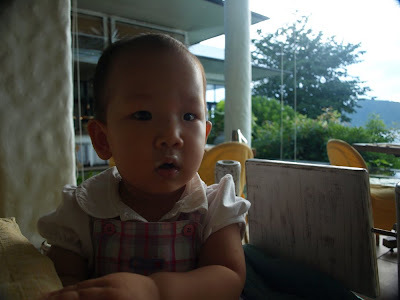 Natalie proudly displays her yoghurt moustache. After eating, Natalie walked around the buffet area. Everyone loved her... she waves "hi" to people, smiles and laughs and blows kisses to them. After breakfast, we head out to the private island. It's 15 minutes away by small, scary boat. Natalie didn't enjoy the boat ride (the engine was really loud). 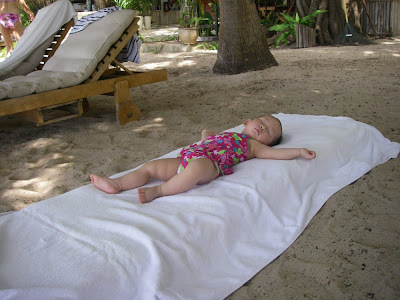 We pulled a mattress off the lounge chair and put it on the sand just in case she rolled over. While Natalie sleeps, the parents play! 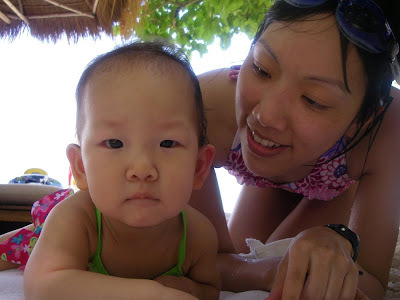 We went snorkeling, played with the underwater cameras (yes, we bought another one) and swam in the ocean. Natalie wakes up. Look at those droopy, sleepy eyes. Back at our hotel room, we had lunch via room service on our balcony. Natalie ordered the mac n' cheese from the kids menu. Yummy mac n' cheese! That's a lot of mac n' cheese! Natalie watching intently while her Daddy helps her finish her mac n' cheese. Later that day, we head to Jackie and Que's wedding. It was a beautiful (and fun!) wedding. Tracy and Natalie at the wedding. The next day, we went to hang out in the family pool with friends. Here's Tracy, Natalie, and Vanessa. Natalie looks grumpy here, but she really enjoyed the pool. We can sit her on the ledge by herself (and count her down to 3) and she'll launch herself into the water (and into our arms). Li-meng, Clark, Vanessa, Kevy, Tracy, and Brad. Can you find Natalie? No, we don't want to go! 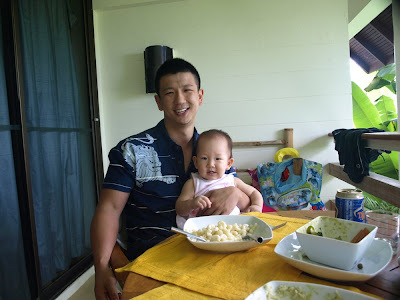 Natalie with her daddy, saying Bye to Phuket. Looks like Nat had some fun in the sun! 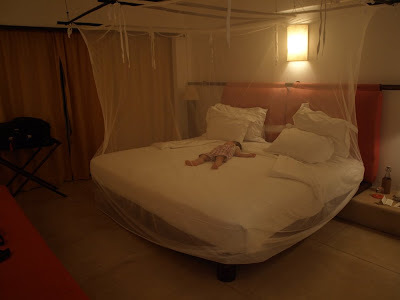 I loved the photos of her passing out on the bed and the lounge chair haha so cute! Olivia didn't like the sand either, so weird eh? I have a friend visiting from out of town so prolly won't make tomorrow's coffee. We'll have to see you next week instead. Looks like it was such a nice holiday! The Evason brings back good memories-I got proposed to there!! The private island is great isnt it? And the lobby is such breathe taking! 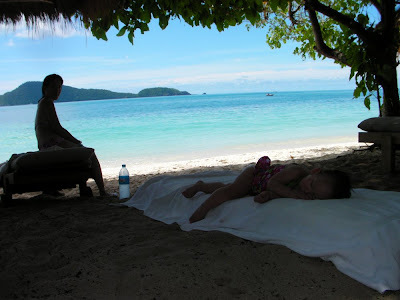 LOVE that photo of Natalie sleeping on the beach. She looks so calm and relaxed. We should all feel like her!